Our cakes are made with locally sourced fresh eggs, wheat flour, two types of sugar and a small amount of sugar-based sweetener (does not contain aspartame) and vegetable oil based non-hydrogenated margarine. Our recipe needs less fat and sugar than the standard cake which is how we reduce the calories. We only use fruits such as lemons, berries, bananas and natural ingredients to flavour our cakes. 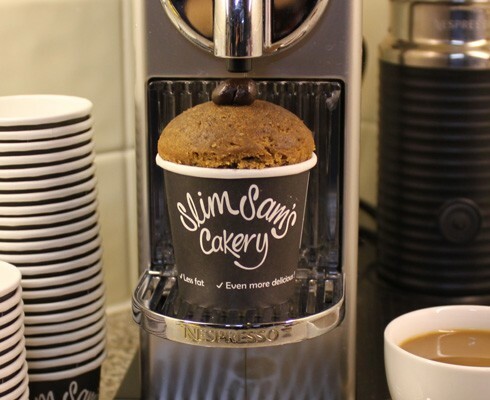 Our cakes are typically 40% less fat and 25% fewer calories than a regular cake. Energy: 283 kcal /1184 kJ. Protein: 6.7 g. Carbohydrate: 42 g. Fat: 9.8 g.
Energy: 170 cal / 710 kJ. Protein: 4 g. Carbohydrate: 25 g. Fat: 5.8 g.
Contains Cow’s Milk, Egg, Wheat, Nuts. The cakes contain the following additives: Sweetener (Sucralose).